My actual birthday is today, but Monday is a lame day to have a birthday on so I jam packed a lot of fun into the weekend leading up to my birthday. I wanted to do something with my friends for my birthday, but I wanted it to be something that involved me doing zero planning other than sending out an email invite. I didn’t even want to have to keep track of who was or wasn’t coming. For many people this would probably involve choosing a bar to go out to, but since I can’t drink that wasn’t really an appealing option for me. Instead I decided to invite everyone to join me at Belvedere Square for their free summer outdoor concerts. Every Friday during the summer they have free concerts while most of the food venues in the square set up booths to sell food outside (of course you can also still get food inside the venues as well). We staked out a spot in the grass and spent a lovely night hanging out, eating some great food, and enjoying the music. The band this past Friday was a Beatles cover band, which I guess is apropos given that Sir Paul McCartney and I share a birthday. Saturday morning my husband and I hopped an early bus up to New York City. 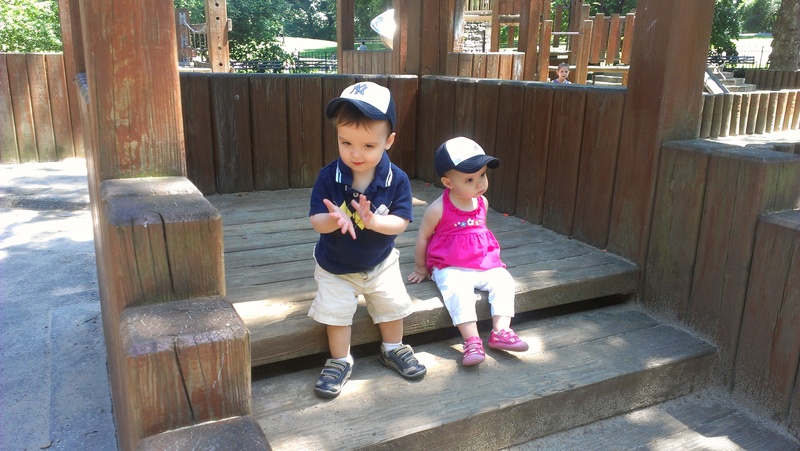 After arriving at my in-laws apartment we went out to grab lunch and then took my twin niece and nephew to the park. They had great fun playing on the stairs since that isn’t something they get to do inside where they live. On Saturday night my husband I ventured out to the theater. I don’t even remember where I first heard about Peter and the Starcatcher, but it immediately jumped to the top of my list of Broadway shows I wanted to see. The play is based on a book by Dave Barry and Ridley Pearson. It’s a prequel to the Peter Pan story, which explains how Peter Pan, the Lost Boys, Captain Hook, and Smee became who they are in the actual story of Peter Pan. I particularly wanted to see it while Christian Borle was playing the role of Black Stache (the character who becomes Captain Hook). He has been involved with the play since it was being workshopped, but it appeared that he wasn’t actually going to be able to star in it once it hit Broadway because of his current role in the television show Smash (as an aside his character Tom, is pretty much the only character on the show I don’t hate). However, due to shooting schedule of Smash he was actual able to perform in the role for a limited time at least. Borle was nominated for and in fact won the Tony Award for Best Featured Actor in a Play this past week. After seeing the play I completely agree he deserved to win. I found the entire play to be utterly delightful, but the energy that came about when Borle was on stage as Black Stache was palpable. It was a very fun show with lots of rhyming and puns (but not groan inducting ones). The staging was quite clever as well. They made amazing use of a single piece of rope. There were some other really cute things that they did with common household goods that I won’t spoil for anyone who wants to see the show because noticing them was part of the fun. If you get a chance to see it I would highly recommend it. 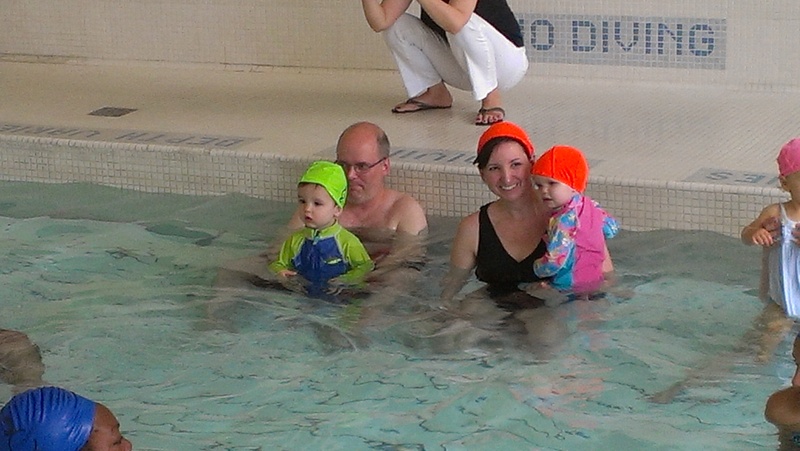 On Sunday we got to accompany the twins to their first swimming lesson. Ryan took to it almost right away, but Lily wasn’t so sure about it until about half way through the class. Luckily neither of them cried like a couple of the babies who screamed pretty much through the entire thing. After the swimming lesson we grabbed lunch at The Boat Basin, which is a great little outdoor grill serving food and drinks right along the river. Then it was time for my husband and I catch our bus back to Baltimore. It was a great birthday weekend. I couldn’t have asked for anything better. 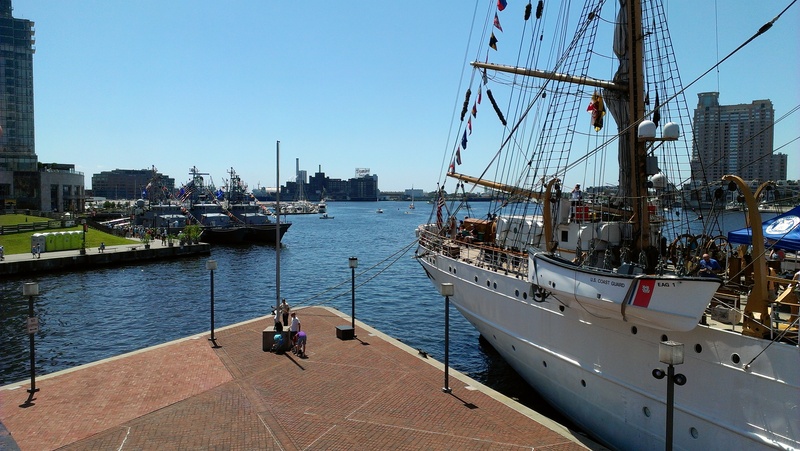 Some days I really love living in Baltimore, and today was definitely one of those days. 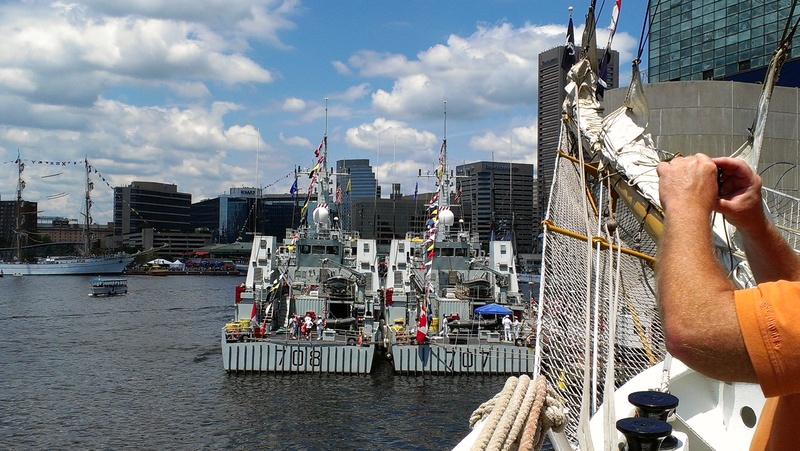 Baltimore is currently hosting what they are calling the Star Spangled Sailabration to celebrate the 200th anniversary of the War of 1812. That war obviously being a big deal in Baltimore since it was during the War of 1812 that Francis Scott Key wrote The Star Spangled Banner at Fort McHenry in Baltimore. Though the song wasn’t actually written until 1814. The festival started this past Wednesday and runs through Monday. I had previously decided to take off today and Monday because I had vacation time to use or lose and Monday is my birthday so it seemed like a good weekend to make extra long. Since I wasn’t working and the weather was supposed to be gorgeous I decided that today would be an excellent day to go check it out. 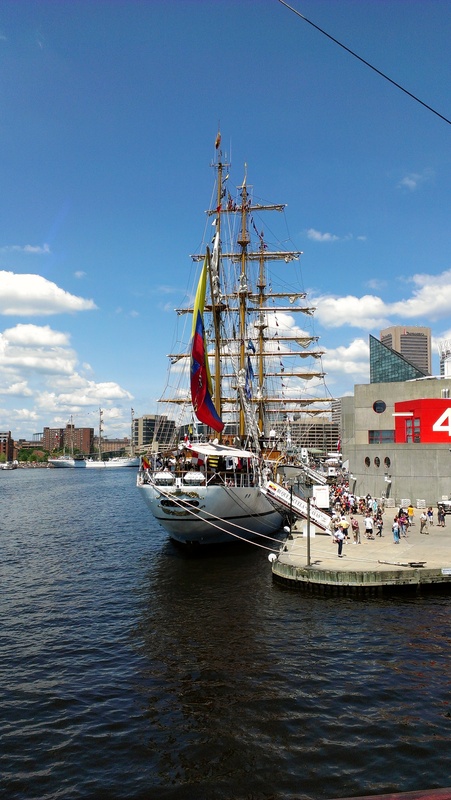 There are ships from all over the world positioned at various places around the water in Baltimore. Most of them are clustered in the Inner Harbor, but there are a couple in Fells Point, and some that we could see across the water in Locust Point. Some of this information is going to be trivial to people not planning on going to Sailabration, but since I have a number of friends planning on going down this weekend I’m going to try and include some pointers. 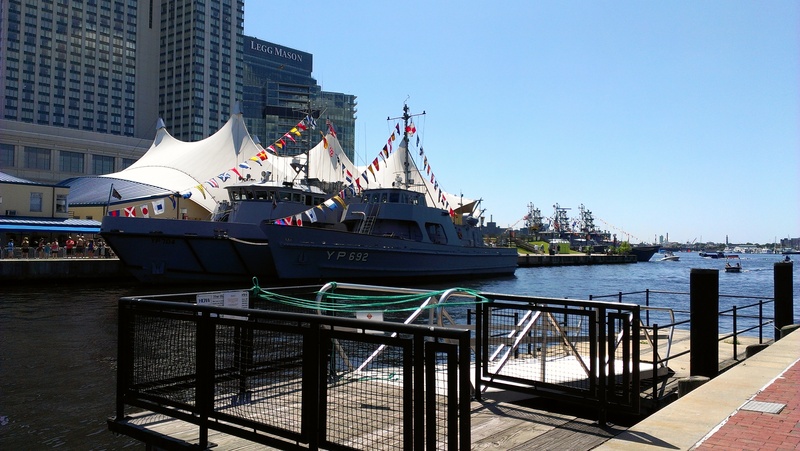 We parked in the Caroline Street garage on the edge of Harbor East and Fells Point, which was great because it let us avoid the craziness of traffic in the Inner Harbor area and put us right in between the two main areas of the festival. We walked along the Promenade over to the Inner Harbor. 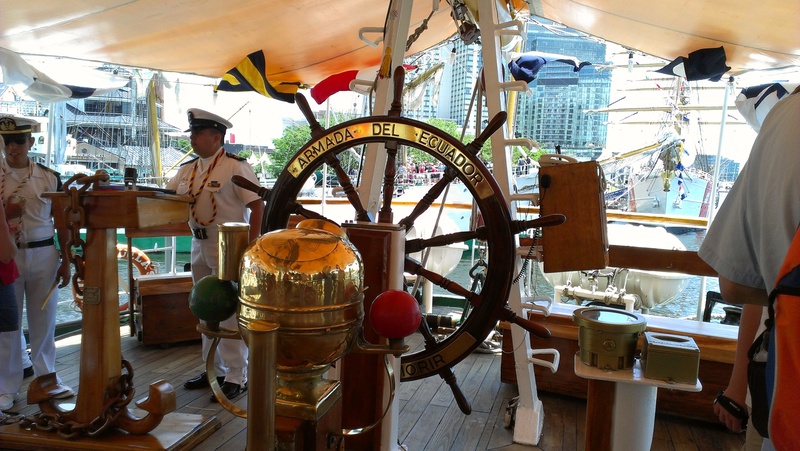 We only boarded two of the ships because the lines were super long for most of them. 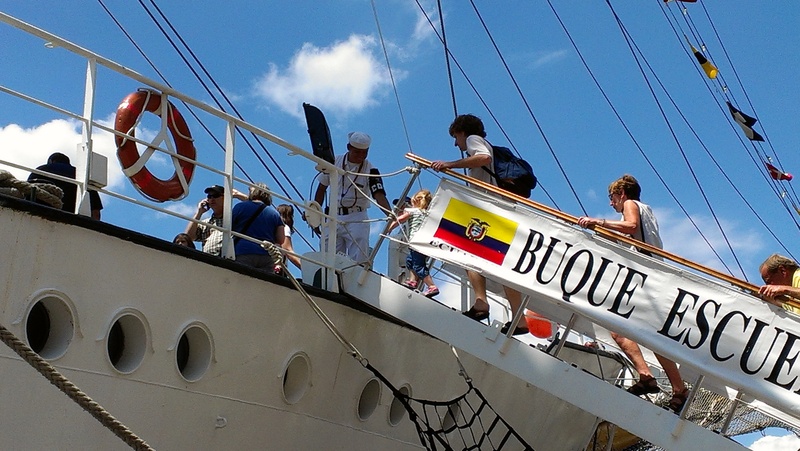 We went on the Columbian ship and Ecuadorian ship because they had the shortest lines partly probably because we were there not too long after they started letting people board them and also because they’re farther out from the Inner Harbor where not as many people were venturing. The Columbian ship was definitely the best one because they gave me Columbian candy and a bracelet. 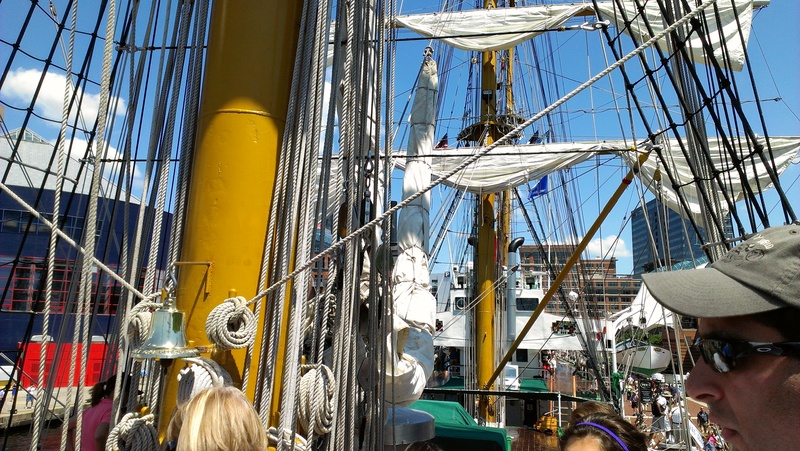 After going on the two ships we continued our walk around the Inner Harbor, which was insanely crowded around the actual harbor. If it was this bad in the middle of a work day I can’t even imagine how nutty it’s going to be around there tomorrow. 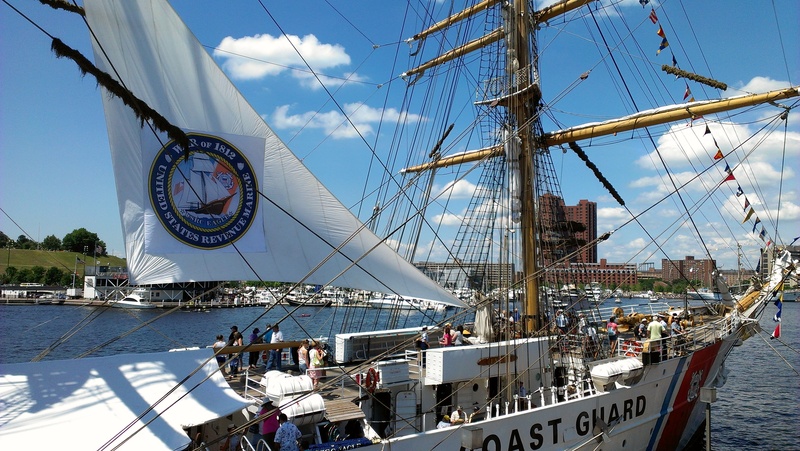 We walked up to Federal Hill to get a good view of all the ships sitting the harbor. It’s amazing how tiny they look sitting there from up on the hill. We had heard that the Blue Angels were going to start flying at 1 to practice for the shows they’re doing this weekend and thought we would have a great view from up on Federal Hill. We hung around until 1:30 with no sign of them, so we finally gave up and grabbed some food by the booths they have set up at Rash Field. After that we started our way back towards Fells Point and as we were standing directly in front of Harborplace the Blue Angels flew over our heads at 2:00. We found the best viewing spot for today was actually on the Promenade off the back of the patio where the new Four Seasons hotel is in Harbor East. It gives you a wide open view of a lot of the harbor area with no buildings in the way, which is key because the planes fly very low and if there are any structures in the way you can’t see them though you can certainly hear them. At that point we were just seeing individual planes doing tricks so after watching that for awhile we made our way over to Fells Point and took a peek at the outside of the Canadian ship there. We decided we didn’t want to wait in line to get on it. Being in Fells Point on a hot day we of course had to stop and get gelato from Pitango. Then we decided to head back to our car when we got a real treat. We were just edging up on the Bond Street Wharf when the Blue Angels appeared again this time flying in formation and doing all kinds of tricks that way. It was another awesome spot to be able to see them without too many buildings getting in the way. It was so super cool. I can’t even describe how amazing it was to watch them flying around all the buildings down there. People in the Legg Mason building and Morgan Stanley certainly got some great views of the planes buzzing by their windows. The pilots were certainly having fun. I’m glad we made it down there today because it doesn’t seem like watching the Blue Angels shows tomorrow is going to be nearly as convenient. Based on the suggested viewing areas for the actual shows it seems like you’ll need to be in other areas entirely to see them fly tomorrow. You may be able to see far away glimpses of them, but it doesn’t sound like you’ll get anything like we saw today at least from the viewing spots we were at. 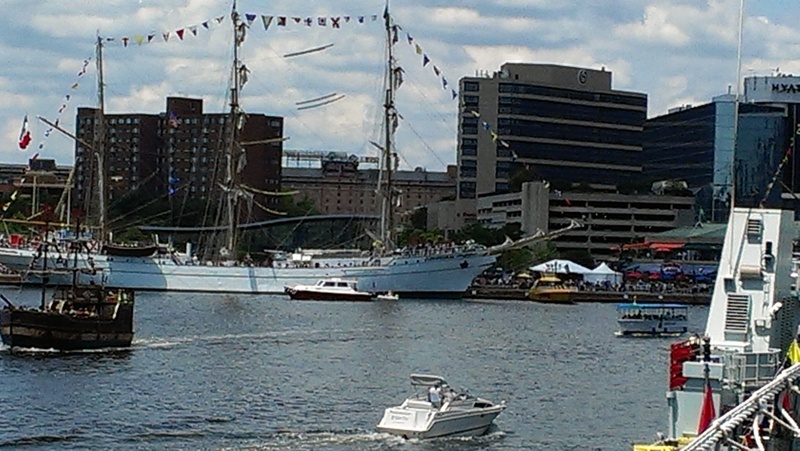 If you’re in the Baltimore area I highly suggest getting down to enjoy Sailabration over the weekend. I don’t really have anything to say, but I’m super digging this song right now. You should too. I love the smell of honeysuckle. One of the houses down the alley from ours has it growing on their back fence. During the spring and summer whenever I park somewhere that it is more convenient to walk up the alley and come in the back door as opposed to coming in the front, I get to smell it as I’m walking past. Tonight was one of those nights. It reminds me of my childhood in Georgia. We had lots of honeysuckle growing in our backyard. I remember picking the flowers and pulling out the little middle stem thing (is that the stamen? I don’t know flower anatomy) at the end of which sits a single sweet drop of honeysuckle nectar ready to enjoy. It’s the taste of summer. I don’t stop and eat anyone’s honeysuckle now, but whenever I happen upon it I’m transported back to sweet memories of summers long ago. My neighborhood plays host to two different street festivals during the year. HonFest, the more well known and popular of the two was held this past weekend. Like most street festivals there is lots of food, music, and booths selling stuff. What differentiates HonFest from other street festivals is the theme. Hon is a term of endearment still often used in Baltimore by some of your older blue collar workers. It’s not unusual to be called hon by waitresses at many old school Baltimore restaurants. HonFest is celebration of these women (though there are a number of Baltimoreans who claim that it is disrespectful). People dress up in cats eye glasses and feather boas and put their hair up in bee hive hairdos. I was really bad about taking pictures this year, so I don’t have any good examples of what I’m talking about. 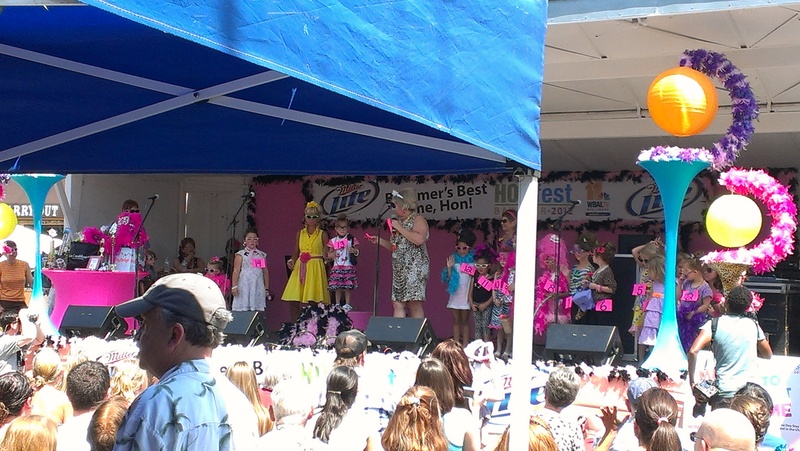 There are contests every year for Little Miss Hon (ages 3-6), Miss Honette (older kids), and Baltimore’s Best Hon (adults). 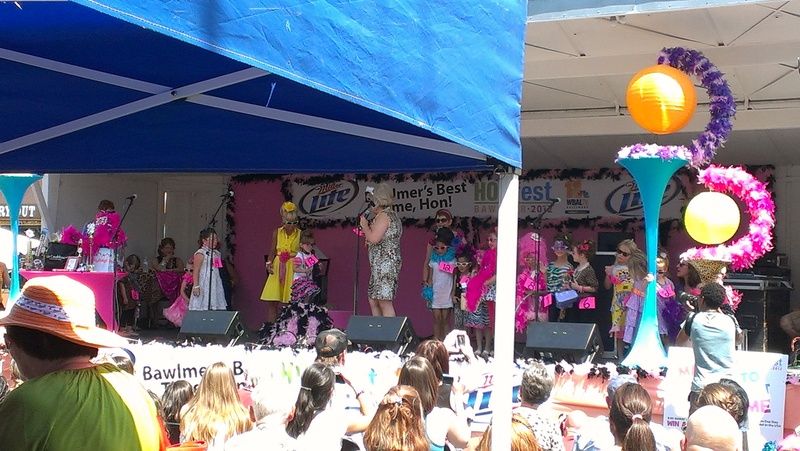 I always like the Little Miss Hon contest because the little kids are super cute all dressed up and sometimes very funny. Based on this year’s contestants I can tell you that Maddie/Madeline is this generation’s Jennifer as I think about 50% of the girls on the stage had that name. Due to the fact that we leave a mere block from the festival we usually hit it up multiple times over the weekend. We went up first thing to watch the Little Miss Hon contest and took a walk around to look at everything. We went back again about an hour later when we decided it was time for lunch and some of our friends let us know that they were about. After getting some food and walking around with our friends we went home again. Our final trip on Saturday was to see my coworkers band that was playing. 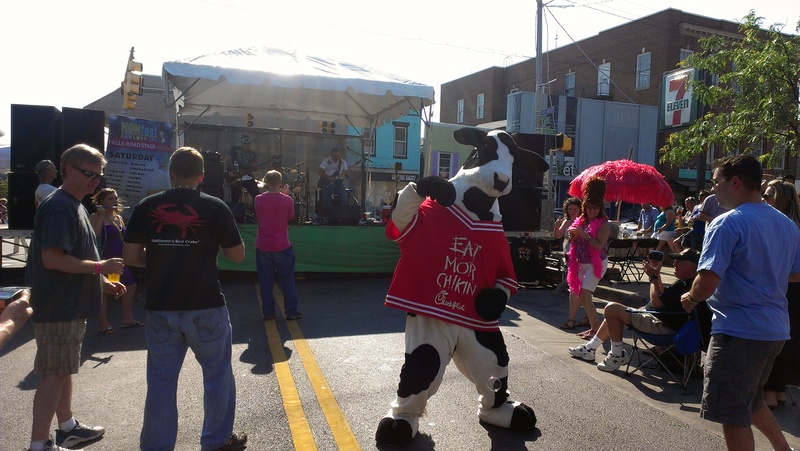 Chick-fil-A had a booth at the festival and had a cow walking around. I grabbed a picture of the cow dancing to my coworkers band. The festival runs all weekend, so I also popped out on Sunday to grab lunch, but that was about it. Even though it makes it really difficult to park in my neighborhood, I look forward to HonFest every year. Last night my friend Jenny and I went to see Kristin Chenoweth in concert at the Hippodrome in Baltimore. It turns out the concert was actually a fundraiser for Hippodrome Foundation. I had no idea when I bought the tickets, but I’m happy I got to do something I enjoy while also supporting a good organization. For anyone who doesn’t know who Kristin Chenoweth is, she is a famous Tony award winning Broadway actress probably best known for her role as Glinda in Wicked though she actually won her Tony for playing Sally in You’re a Good Man Charlie Brown. She has also guested or starred in a number of television shows in the past several years. She was in the last two years of The West Wing, had a supporting role in Pushing Daisies, and most recently starred in the short-lived ABC drama GCB. She also had a recurring guest role on Glee. The concert was fantastic! It was more of a staged show rather than just a concert. Kristin had 3 backup singers who she sang various duets and danced with in various ways throughout the show. She sang songs that she herself has performed on Broadway or on television as well as a number of other Broadways songs from shows she was not in. She also has a new CD she was promoting with some original music on it, so she sang a handful of songs off of that as well. The show was also wickedly funny (see what I did there–hee), which I wasn’t necessarily expecting. I know the majority of it was pre-scripted but like any good performer, Kristin had a way of drawing the audience in and making it feel like she was just telling us stories she was thinking up on the fly. There were also some cute kind of sketches, one of which involved some of the puppets from Avenue Q, which beat out Wicked for the Tony the year they were both nominated. Apparently one of the things she has been doing at every show is to pick a young girl out of the audience to sing the duet For Good from Wicked with her. There was a 16 year old girl in our audience who is obviously a huge Kristin Chenoweth fan and knew that this was going to happen because as soon as Kristin finished singing Popular (also from Wicked) this girl started shouting out “Me, me, me!”. So Kristin of course chose her to sing the duet. The girl was so super, excited. She was not actually a very good singer, so she’ll probably never have the experience of being on stage in front of a huge crown like that again so I’m really happy she got to have that experience. The whole thing was really sweet. It was a great show. She’s performing in DC tonight, so if you’re in the area I highly suggest you make some last minute plans to go out and see her. Midnight City by M83 is one of those songs that I didn’t fall in love with the first time I heard it, but it didn’t take long for it to become one of my favorite songs of the year. It has that crazy awesome hook that just pulls you into the song and won’t let you go. I’m also partial to it because it evokes some of the music from previous times in my life. It reminds me a lot of Erasure, who I was a big fan of back in the day. Also the saxophone that becomes very prominent at the end of the song is very reminiscent of the saxophone found in much of late 70s and early 80s rock, but which you don’t really ever hear anymore. It’s kind of a mash up of two earlier but entirely unrelated genres of music and I dig it.